As far as I know, not even the advance review copies are available yet so I'm sure this must be a mistake from the seller. Perhaps Jarkko can confirm the release date as Oct 16? The question has answered itself. The availability has been changed to “not available “ in the last hour. It seems that someone was a bit “trigger happy “ at Bol.com and they corrected it. As far as we know, there is no change in the schedule. The book will be published in several languages at the same time. Have put orders on bookdepository for UK version and Amazon China for International version. Its going to be a long wait. Luckily for us Downuder Bob Dylan is visiting in August. Not surprisingly the book did not arrive today . 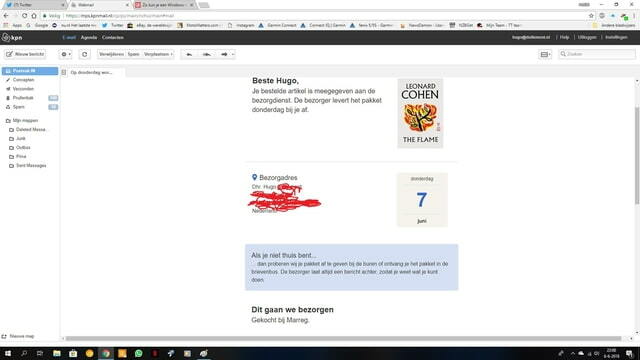 But that is not the end of it, they did sent me an email today wishing me lots of reading pleasure with the book and a kind request to pay the invoice since they assumed I received it. Wrote them an email that I was more than happy to pay I they had delivered it since the publication date is set for October. Just weeks before his death in late 2016, Leonard Cohen told The New Yorker that he was ready for the end to come. He just wanted enough time to put his last book in order. Fortunately, that time was granted. 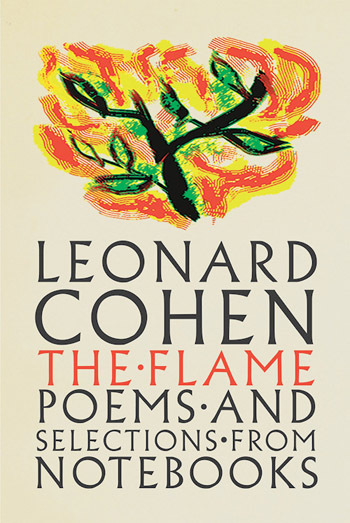 The Flame is Cohen’s eloquent farewell, a valedictory collection of lyrics, poems, notebook sketches, and self-portraits that maps his singular creative journey. As noted in the Rock and Roll Hall of Fame’s citation, “For six decades, Leonard Cohen revealed his soul to the world through poetry and song—his deep and timeless humanity touching our very core. ”In addition to new poems about war, desire, regrets, lamb chops, and hummingbirds, and lyrics from his last three albums, including the chart-topping “You Want It Darker,” The Flame includes carefully selected excerpts from Cohen’s voluminous notebooks, which he kept faithfully over the years. Readers will find in these pages the subjects that have always preoccupied Cohen: the dimensions of love, the secret code of existence, and the hope for transcendence in a broken world. Now available for pre-order in the US. Thanks to Leonard’s manager Robert Kory, and the publisher, we have a proof copy of the book to show at the Budapest Event! Just ask me!